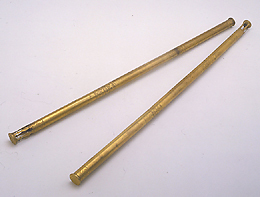 These are two similar brass staffs each made of three pieces fitting together. Each piece has a scrollwork decoration at the end, and has a rectangular longitudinal groove. In each case, one end of the staff has a lid and the other end has a decoration pierced and shaped in the form of a balustrade , then engraved with scrollwork. This is then covered by the lid, which in one staff is detached. In the centre of the section circle is a pin. They have a similar decoration and can be associated with other parts of mining instruments, namely Epact nos. 27017, 63427, 60949, 39614 and 59706.